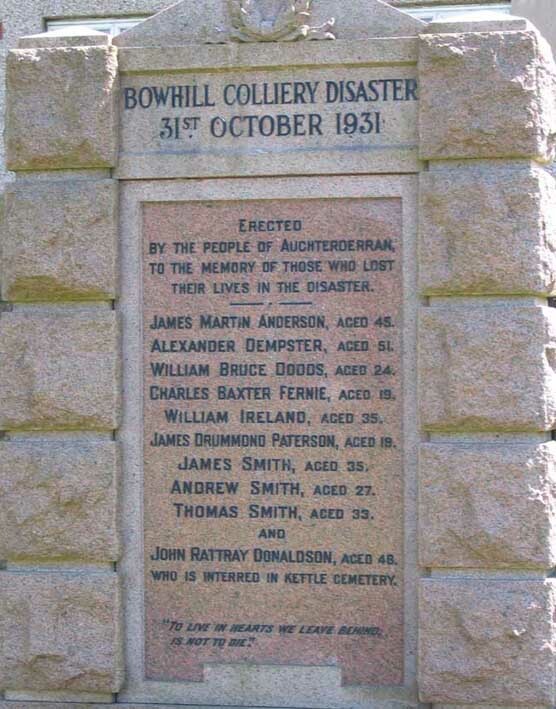 Mining Disaster At Bowhill - Ten Men Killed - Deadly “White Mist” - One of the most terrible in the history of the Fife Coalfield occurred ayt No 2 Pit of the Bowhill Collieries, belonging to the Fife Coal Company, last Saturday. Rescuers' Heroic Efforts - The men who were employed removing the position of a fan in the “Hutt Dook” section of the Dunfermline Splint, 5 foot seam, were killed as the result of an ignition of afterdamp. The accident took place between 11 and 12 o'clock, but it was not until 1.10 pm that the knowledge was flashed to the surface. Heroic rescue attempts were made by the members of other repair gangs at work elsewhere in the colliery, and by ambulance and rescue brigades from neighbouring collieries who volunteered their services, but their efforts were impeded by the presence of noxious gases, and although the bodies of the victims were located almost immediately after the accident it was not until seven o'clock on Sunday morning that the working parties reached the spot where the explosion had occurred. Accident Discovered - The accident was discovered by Mr Jas Clark, oversman, Balgreggie Park, Cardenden, who was working in another section of the pit about 1000 yards away. He heard a slight rumble and felt a rush of air. He did not attach much importance to it, but decided to investigate the cause. Mr Clark reached the nearest of the dead men and tried to haul him clear, but had to desist for fear of being overcome by afterdamp - the deadly “white mist”. To reach the pit bottom, Mr Clark had to travel up the haulage road which barely suffices to permit the passage of a man on a bogey, a distance of 1500 yards with an incline of 1 in 3. He reached the pit bottom shortly after 1pm and telephoned the dread news to the surface. At once instructions were given for rescue brigades to be summoned from other Fife pits. Men from Cowdenbeath armed with the latest rescue apparatus arrived within seven minutes of the call being received. In all seven rescue teams under the direction of of Mr J J Ford, safety inspector, went down. Three local doctors went with them and the party was joined in the course of the evening by Mr Augustus Carlow, managing director of the Company; Mr C C Reid, general manager and his son Mr William Reid. Mr H M Foster, Mr H T Roberts, and Mr C A Groves, inspectors from the Ministry of Mines, were early opn the scene and went down the pit with the rescuers. Mr William Adamson, former Secretary of State for Scotland, drove from Dunfermline, and was underground until early on Saturday evening. He was accompanied by Mr James Potter of the Fife, Clackmannan, and Kinross Miners' Union. The rescue party very soon found they had a heavy task in front of them. A high percentage of gas prevented them from getting anywhere near the scene of the explosion. Several canaries were taken down the main-level and the heading, but as all but one died almost at once it was considered unsafe for the rescuers to proceed until the gas had been cleared. The deaths of the birds indicated that there would be little or no hope for the ten men. To remove the gas and prevent it from spreading it was necessary to reverse the air current. This formidable task involving the alteration of fans, was carried out by the rescue brigades wearing their heavy gas masks. The could proceed only very slowly, and it was well into the afternoon before the work was completed and the reversed air current commenced to drive the gas away by an outlet far from the rescuers. News of Disaster - When the first news of an accident below ground reached the surface, rumour of disaster spread like wildfire through the village and amongst those clustered about the pithead and crowds of anxious relatives and friends hurried to the scene. All that was known in the early stages was that an explosion of some magnitude had occurred in No 1 Pit, about a mile from the bottom of the shaft, and that there was a fear that a repair squad of ten men engaged in moving a fan from one section to another might be trapped. It was fortunate that Saturday was an idle day, so that the only men in the workings were oversmen and oncost workers engaged in repair duties. Normally over 1200 are employed at the colliery, but only about 30 were in the vicinity of the spot where the explosion occurred. Hours of anxious waiting ensured before any definite news came from the rescue parties to those at the pithead. And the news that came dispelled practically all hope that lingered among the relatives of the entombed men. Through great exertions the rescue party had got to within about 50 yards of the scene of the disaster, but beyond that point they could not go owing to the volumes of deadly fumes which lingered in the neighbourhood. On one of the few occasions he came to the surface during the long battle for the dead, Mr C C Reid, almost exhausted, addressed the crowd of tense watchers. “I regret,” he said simply, “that all the men have perished.” A few women fainted on hearing the news, and were carried to tragic little homes in which the merriment of Hallowe'en should have reigned. Others drew their shawls or coats more tightly round them and continued their vigil. Graphic Stories - For six hours after the first rescue party had descended no news of the real nature of the accident or prospect of rescue were received at the pithead. The first rescue team rose just shortly after seven o'clock after fully six hours strenuous searching. One of the men told a graphic story of the rescue. He was in a rather helpless condition himself, and seemed to have been through a harrowing ordeal. Shortly after eight o'clock on Saturday night word came to the surface that the bodies had at last been definitely discovered. Not the slightest hope could be given that any of the men survived - indeed, it was all too clear that all had perished in the first moments of the explosion. They had had no chance of escape. After this announcement most of the crowd went home, but here and there groups of miners remained throughout the night. A few occupied the time preparing a mortuary in one of the storerooms. At 11.30 on Sunday forenoon, practically twenty four hours after the explosion had occurred, the bodies were brought to the surface in pairs. For twenty minutes the muffled toll of a bell in the engine room gave the signal that the two bodies were ascending. Over the crowds of several hundred tearful women and haggard men fell a strange hush, which, as the cage made its melancholy journey, was broken only by sobs. So came the little procession of the dead. A great crowd of villagers, among whom were the relatives of the dead men, were waiting at the colliery. 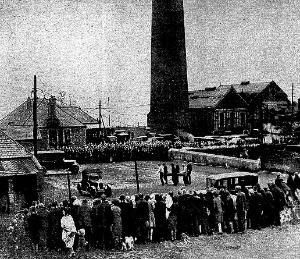 A storehouse near the pithead was used temporarily as a mortuary, and many of the women among the onlookers broke down as the stretchers bearing the dead men were carried from the pithead. Identification of the bodies in the mortuary was made by relatives. In many cases it was almost impossible owing to the charring of the bodies, and fragments of clothing and lamps found alongside the dead men formed the only means of identifying some of them. Despite the courage shown by the relatives, the task of identification was one that almost overcame some of them. In the improvised mortuary the bodies were placed in coffins, and in the early afternoon the removal of the dead to their homes began. A hearse travelled back and forward between the colliery and the village ten times, taking the bodies one at a time. It was not until after four o'clock that the hearse made it's final journey. King's Message of Sympathy - At 2.20 on Sunday afternoon the Rev A M'Neill Houston, minister of Auchterderran Parish Church received the following message from the King:- Buckingham Palace, The Queen and I are distressed to hear of the serious explosion in the Bowhill Colliery, and we offer the families of those who have perished our heartfelt sympathy in their suffering and tragic bereavement. George RI. The telegram was read at the afternoon and evening services at Auchterderran Church, and Dr Houston conveyed the King's message personally to the relatives of the dead men on Monday. Sympathy with the widows and relatives of the deceased men was expressed on Monday at the meeting of the National Union of Scottish Mineworkers, held in Glasgow. Mr Jas Doonan, the president, who occupied the chair, referred to the recurrence of such accidents, and emphasised the risks undertaken by men of their dangerous calling. On his suggestion, a message of sympathy was sent to the Fife and Clackmannan Miners' Association. Inspection of Locus - About 11 o'clock on Monday forenoon the gas in the affected area was cleared sufficiently to permit of an inspection being made. Mr Charles C Reid and other colliery officials, accompanied by Mr John Masterton, Mr A K Horsely, HM Electrical Inspector of Mines for Great Britain, and three other mines inspectors, descended the pit to the scene of the accident. There were also three Union officials representing the relatives of the deceased men. The party ascended the pit about 5.30pm but no statement was issued as to the result of their examination. Mr C C Reid in an interview, said the locus had been thoroughly examined, but nothing had been determined as to what had caused the accident. Nothing would be known until the Mine Inspectors issued their official report, and an official inquiry held. The has had been driven out of the section and the position was normal. The Funeral - The funeral of those who perished in the disaster took place in Wednesday. Shopkeepers carried on their business as usual until mid-day when shutters were put up and blinds drawn. Children continued to play in the streets, and housewives hurried on with their daily tasks, but over all hung an atmosphere of sorrow. The first real glimpse of it came at the main juncture of the Bowhill streets, where dozens of miners stood talking. Many of the pits in West Fife were idle, and the interments took place within a stone's throw of the pit where the men died. With one exception the victims of the disaster were buried side by side at the south end of the Bowhill cemetery. It was at first suggested that the men should be buried in one large grave, but after identification that suggestion was changed, and they were laid in separate graves, less than a hundred yards from the gates. The only victim who was not interred at Bowhill was John Donaldson, whose remains were taken to his native Kingskettle. After the service the Pipe Bands led off the funeral procession to the strains of “Scots Wha Hae.” From the school the cemetery is about a mile away, and as the procession slowly wended its way along every man in the crowd, which was estimated at about 10,000, doffed his hat in a tribute of respect. Just as the cortege neared the cemetery, the sky darkened and rain fell, but immediately afterwards there came a brilliant burst of sunshine and a huge rainbow spread across the sky. The rain, however, was only delayed, and before the last coffin had been borne through the gate rain was falling heavily. The procession filed in to the strains of the “Land o' the Leal,” and the nine coffins were laid out in two rows - one of six and the other of three. Mr William Maguire, a lay preacher at St Fothad's Mission conducted the committal service, and Rev Dr Houston gave the Benediction prayer. The nine coffins were lowered amidst an impressive hush. It was almost impossible to hear the service from any distance, the wind rendering the loud speakers, which were erected in the cemetery, practically useless. One of the clearest statements concerning the disaster was given to a representative of The Scotsman by Mr Allan Hutt, who is in charge of the ambulance department at the colliery. Mr Hutt gave a detailed account of the rescue work. He was among the first men to go down into the mine after the news of the disaster had reached the surface, and did not come up to the pithead again until nearly 24 hours later, when the bodies were brought to the surface. A Mile From The Shaft - The point where the explosion occurred, explained Mr Hutt, was about a mile from the foot of the shaft. The 10 men had been engaged in moving an electric fan from one point of the pit to another, the purpose of the fan being to drive out explosive gas from that part of the pit which was known as a safety lamp section - a section, that is, where it was essential to work with safety lamps. It was situated at the end of a gallery 300 yards long running eastwards from the bottom of the long "dook", a sloping roadway. The task of the working parties was hindered not so much by falling debris as by the deadly gases - carbon monoxide and others - generated by the explosion. The only men who could reach the entombed party were the masked rescue brigade, specially trained for the work, and able to penetrate into poisonous areas. The ambulance men and others, who were unmasked, concentrated in arranging fans at the foot of the dook and at the entrance to the section at the end of which the men had been killed. By arranging two fans blowing fresh air into the section and another acting as a suction fan to draw air and gas out through another gallery, the task of clearing the atmosphere was accomplished. This was a long and difficult piece of work, which went on steadily all through the night, and it was not until 10 o'clock yesterday morning that the air was sufficiently pure to enable the workers to reach the point where the bodies were lying. With the conditions now made possible for the final task of taking the bodies to the surface, the stretchers were carried right in to a point near the place where the dead men had been found. The bodies were then conveyed to the stretchers and carried out one by one. Possible Cause Examined - A point of great importance was discussed by Mr Hutt. A theory had been considered that the explosion might be due to the ignition of inflammable gas by electric spark in some part of the mechanism of the fan the which the men were engaged in moving from one position to another. In order to move the fan it had been necessary to disconnect it for some time, and the quantity of gas would be liable to collect in the section during the time when the fan was not in operation. It was thought possible at first that a spark in the motor or at the plug might have caused the explosion. This theory however was discountenanced by the discovery of which was made at the foot of the dook that the wire leading to the electric fan was not plugged in at the distributor situated at the entrance to the section, and that therefore, even although the fan had been reconnected by the men working at the end of the section, it would still be "dead" and not capable of operating. The cause of the explosion therefore, remained unexplained. 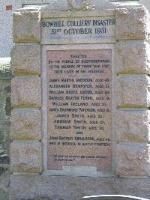 Deputy Sheriff Umpherston and jury which included 3 women, concluded the enquiry at Dunfermline yesterday into the pit explosion which nearly 3 months ago led to the deaths of 10 miners at Bowhill Colliery, Fife. The jury found that the deaths were due to an ignition and explosion of firedamp but they were unable to assign any cause to it. They warmly commended the bravery of the rescue workers. In particular they described as being worthy of the highest traditions the conduct of James Clark, and overman who seeing a glimmer of light some distance along the coal face, crawled without any lamp to detect gas until he reached the glimmer and found the body of a man who was still breathing. He was unable to move the body down the coal face, so returned for assistance. With a safety lamp he crawled back a long the coal face until his lamp filled with firedamp and was extinguished, compelling him to give up his attempt at rescue.